Spreading over a 21-hectare area amidst the charming nature of the Cretan mountains, the Kalimera Kriti Hotel and Village Resort is located at about 35 min from Heraklion International Airport, 7 km from the archaeological site of Palace of Malia and a mere 900 metres from the former fishing village of Sissi with its picturesque little port and lively shopping centre. Inspired by the architecture of the Minoan palaces with incorporated neoclassic elements, the spacious Main Building houses 415 rooms including 141 suites, while the three villages harmoniously spread out in the landscape offer 40 waterfront bungalows built along the lines of traditional Cretan architecture. All guestrooms are tastefully furnished and appointed with all modern amenities including bathroom/WC (with hairdryer), direct-dial telephone, safe (free of charge), music, satellite TV, mini-bar, air conditioning (centrally operated in the Main Building, individually adjustable in Bungalows) and furnished balcony or terrace opening to splendid vistas. There are three stylishly decorated restaurants with spacious outside terraces and non-smoking zone serving a large variety of local and international cuisine. Centered around a small square are the hotel’s Tavern, Cafeteria and the Shopping Arcade. The shops include a boutique, souvenir and jewelry shop, a mini-market, and a shop specialized in Greek and Cretan products. The main building features a vast, elegant reception area and a number of public areas such as bars, lounges, a bridge room and TV-room, and several conference rooms. There is a traditional Greek café and on the beach a snack bar serving refreshments and light snacks. Other amenities include two fresh-water pools and a heated indoor pool and children’s playground, as well as free deck chairs, sunshades and towels at the beach. The hotel has 6 tennis courts, 2 squash courts, mini golf and facilities for table tennis and beach volley. A large variety of water sports and instruction possibilities comprising water-skiing, surfing, diving, parasailing, jet ski, pedal boat, canoe, banana boat and tubes are also available. A team of expert animators organizes day and evening animation activities, while several times a week special evenings are organised with live music, disco night or Greek folklore programmes. The Kalimera Kriti Hotel enjoys a reputation of professionalism in the organization of conferences, seminars and incentives. It provides an ideal setting for top-level conferences, offering 9 luxurious meeting rooms with a capacity of accommodating from 10 to 500 persons. 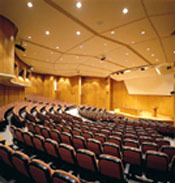 All conference rooms are outfitted with the most up-to-date audio-visual equipment.